"It is easy to make governments. 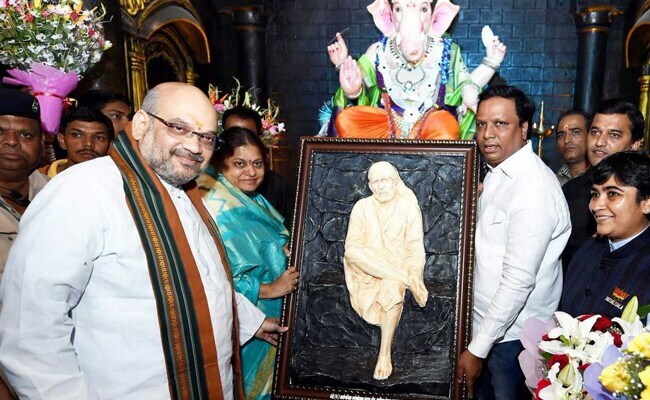 It is hard to make a good karyakarta (party worker)," Mr Shah said, lauding PM Modi's role in building the organisation at the grassroots level. Mumbai: BJP President Amit Shah today credited Prime Minister Narendra Modi with laying the foundation of an "unbeatable" BJP in Gujarat while fighting a smear campaign. PM Modi laid the foundation of a strong and "ajeya" (unbeatable) BJP in Gujarat, he said after releasing the Hindi translation of a book on Modi 'Hamare Narendrabhai' authored by Dinesh Desai. "Modi's life has been full of hardship. Many people tried to malign him, but he has come this far while countering such people," he added. Mr Shah said the role of party as an important part of democracy was established for the first time in the 1995 Gujarat Assembly polls when there was change of power (from Congress to BJP) without any significant development like Emergency or the Ram Mandir issue. "This is the first instance of victory due to building a strong party organisation," Mr Shah said. PM Modi took over as Gujarat chief minister in October 2001 but was involved for long in building the party in the state. "As CM, Modi had promised to bring electricity to all villages in Gujarat in 24 months, but he did that in 18. The then opposition leader and former CM Amarsinh Chaudhary told Modi that being an engineer he thought the target was unachievable, but Modi kept his word," Mr Shah said. The BJP president said under PM Modi the country was seeing the end of "politics of caste, dynasty and appeasement" and moving forward on the path of politics of performance. Under the United Progressive Alliance (UPA), every minister thought he was Manmohan Singh while nobody gave importance to the real prime minister, Mr Shah said. The Modi government has been "without a taint" in the last three years, compared to the charges of corruption of Rs 12 lakh crore under the UPA government, Mr Shah claimed. Our government has provided a life of dignity to young girls by building four lakh toilets in three years, he said. Maharashtra Chief Minister Devendra Fadnavis said the book contained rare photographs of PM Modi from his childhood and youth. "When Modi addressed the US Congress, he received a standing ovation 56 times," Mr Fadnavis said. Union minister Piyush Goyal cited a popular greeting card with the words 'The world's greatest boss' while speaking about his experience working with PM Modi. Describing the pair of PM Modi and Mr Shah as "incredible", Mr Goyal said, "We have never seen such an excellent coordination between the government and the party before this."